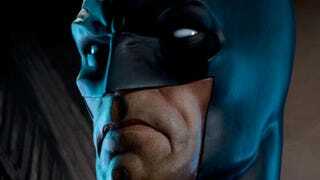 Next year, Sideshow will be releasing a bust of Batman. This won't just be any old slab of Dark Knight face-and-shoulders, though. It'll be a 1:1 scale replica of Batman's head. With a level of detail, and price, to match. The piece is 29 inches tall and 22 inches wide, and has been handcrafted. All that Batman doesn't come cheap, however: it's selling for USD$680. The 1:1 bust goes on sale in Q2 2012.